Mr Durkan said patients were waiting 11 months for an assessment. The Western Trust has apologised to local patients for the distress being caused by ongoing occupational therapy assessment delays. Growing demand and staff shortages have resulted in people having to wait longer for appointments, while Trust bosses said they were doing all they can with the resources available to address the problem. The Trust was responding after SDLP Foyle MLA Mark H Durkan recently warned that people were waiting almost a year on average for their assessment and in some cases over two years for basic installations such as handrails. Mr. Durkan had claimed that the delays in assessment was stripping people of their dignity and needed to be addressed as a matter of urgency. Occupational Therapy involves the provision of services to people whose ability to function in daily life has been disrupted by physical illness or injury, developmental problems, the ageing process or mental or emotional illness. 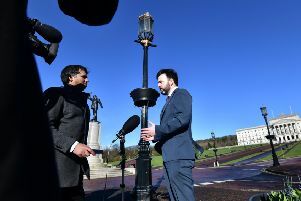 Responding to the concerns raised by Mr. Durkan, a spokesperson for the Western Health and Social Care Trust said it was looking at bringing in measures to help address the situation. “The Western Trust acknowledges that the current waiting time for Community Occupational Therapy assessment is longer than we would like our clients to have to wait. This is due to the growing level of demand for this service as well as reduced staffing levels,” she said. “The Western Trust would like to reassure the public that it is doing all it can to deliver the shortest waiting time possible within the resources available to the Occupational Therapy service. One such project is the development of a Drop-in Clinic which will run on a regular, ongoing basis and offer a fast track service to clients with non-complex level need which can be addressed without visiting the home environment. Mr Durkan has warned that the increasing waiting list for assessments is “depriving people of their dignity and ability to live independently. “It is wholly unacceptable that people here are waiting on average 11 months for an initial Occupational Therapy assessment,” he said.